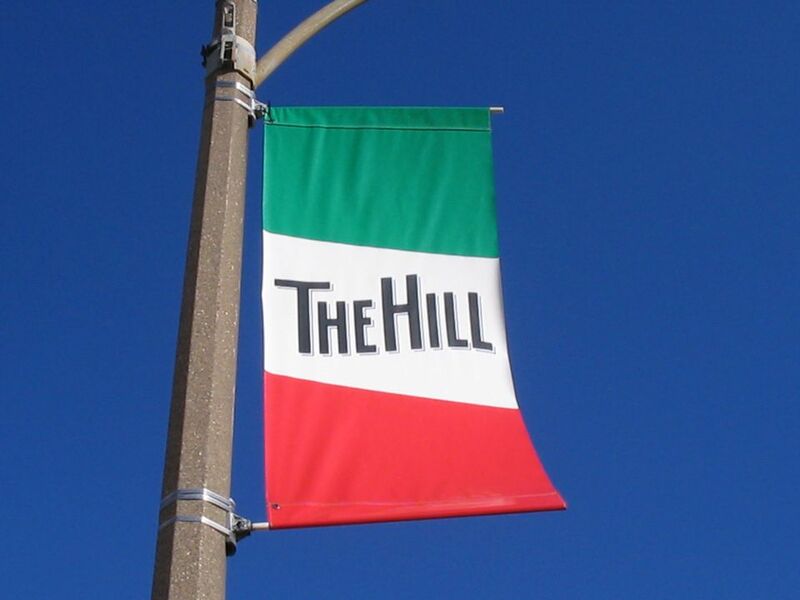 "The Hill" is one of St. Louis' most famous neighborhoods, partially because several of its ​​Italian restaurants have achieved national fame, but more so because it remains one of the city's most intact ethnic neighborhoods. By some accounts, up to 75 percent of its residents claim to be Italian. After spending just a few minutes on the Hill, you'll wonder if the number isn't closer to 100 percent. The Hill is located south of Manchester Avenue, between Hampton Avenue on the west and Kingshighway Avenue on the east. It's named for its proximity to the city's highest point, located at the intersection of Sublette and Arsenal. Although the settlement of the area began as early as the 1830's, Italian immigrants didn't begin arriving in large numbers until the end of the nineteenth century, primarily to be close the region's rich clay mines. Houses in the neighborhood reflect its immigrant history, with modest bungalows and shotgun shacks filling most streets. But don't judge the houses based on square footage; residents are known for taking great pride in their homes and yards, so touring the residential streets can be very enjoyable. A walking tour of the Hill will give you a good sense of its history and the way of life of its residents. But if you love food, you're in for a real treat; a walking tour of the Hill can't help but turn into a culinary adventure. In addition to the dozens of great restaurants within its boundaries, the Hill also has wonderful grocers, bakeries and other food shops. Because you won't want to pass on picking up many of the area's specialties that require refrigeration, bring a cooler and stash it in your car. Speaking of your car, park at the intersection of Shaw Boulevard and Hereford Street, just west of Kingshighway Avenue. First stop: Viviano's Grocery. Viviano’s is located at 5139 Shaw Avenue. Viviano's is a great place to introduce yourself to the Hill. The Viviano family has operated the Italian grocery in its current location for more than 50 years. Staples such as olive oil, flour, spices, and pasta fills its shelves. But near the back, Viviano's has sectioned off an area for cheeses, meats, prepared foods and an olive bar. If the aroma from this section wasn't draw enough, the bustle of activity surrounding it will certainly capture your attention. Try the store's signature stuffed peppers, which feature mozzarella cheese wrapped in prosciutto, stuffed inside a large green pepper. Viviano's also sells its own line of classic Italian ingredients including extra virgin olive oil, tomato basil sauce and a white sauce made with St. Louis' infamous provel cheese. One particular local favorite is Viviano's Italian breadcrumbs, mixed onsite with parmesan and romano cheeses and parsley. Besides being exceptionally fresh and tasty, many of Viviano's products are actually less expensive than their counterparts found in regional or national grocery chains. Good thing you put a cooler in your car! Next stop: Shaw’s Coffee. Take a right out of Viviano’s. Shaw’s is located at 5147 Shaw Avenue. Italians take their coffee as seriously as they take pasta, cheese or wine. It's no surprise then that Shaw's Coffee is a great coffee shop. But Shaw's is more than a coffee house, it's an independent roaster. Located in a magnificent old bank building, Shaw's has an airy and attractive atmosphere. You can even drink coffee at a table set within the original bank vault. Before you leave, consider buying a bag or two to take home. Shaw's dark roasts all of its coffees and offers varietals from Africa, the Pacifica Rim, and Latin America. Next stop: St. Ambrose Catholic Church. From Shaw's Coffee, cross Shaw Avenue and go south on Marconi Avenue for two blocks. St. Ambrose is located at 5130 Wilson Avenue. St. Ambrose Catholic Church has been a vital component of the Hill neighborhood since its dedication in 1926. Few other St. Louis communities retain such a strong connection to one house of worship. For many resident families, St. Ambrose is the focal point of daily life on the Hill. Built in the Lombard Romanesque style, St. Ambrose is said to be modeled on the historic San Ambrogio Church in Milan, Italy. Doors are usually open during the day, and visitors are welcome to quietly view the church's interior. If the doors are locked or a service is underway, admiring the church's terra cotta and brick exterior alone is worth a stop along the tour. In front of the church is a statue called simply "The Italian Immigrants." The statue memorializes the Italian families that arrived in St. Louis looking for a better life. Today, the statue has become a preferred symbol of the neighborhood, right along with the Hill's famous green, white and red painted fire hydrants. Next stop: Girasole Gifts and Imports. From St. Ambrose Catholic Church, cross Marconi Avenue. Girasole is located at 2103 Marconi Avenue. Girasole sells a diverse range of Italian products including ceramics, beauty products, jewelry, fashion accessories, and books. But you don't need to be Italian to find something you like. For example, the store's selection of Italian handbags will appeal to any women searching for a fashionable new bag. However, if you're looking specifically for a souvenir of the Hill, Girasole's a great bet. One of its most popular items is a miniature replica of the Italian Immigrants statue located just across the street. The statue is actually exclusive to Girasole. The store also carries Italian flags, buttons, t-shirts and other Italian-themed gifts and products. Next stop: Eovaldi’s Deli. From Girasole, go south (turn right as you walk out the door) on Marconi to Bischoff Avenue. Turn right on Bischoff and go one block. Eovaldi’s is at 2201 Edwards Street. Eovaldi's has just a handful of tables, half of which sit beneath shelves stocked with large cans of tomato sauce and other cooking supplies. However, instead of making the atmosphere seem unwelcoming, it actually feels like owner Denny McKay has set up a couple of tables just for you within his kitchen. And the kitchen's the reason people come to Eovaldi's, even if they don't eat inside the deli. Other local delis may be better known, busier or have more history, but Eovaldi's delivers great Italian food in a simple yet traditional market setting. Sandwiches, such as the Sicilian Bomber, the Godfather, and the Eovaldi's Special are local favorites, as are the deli's homemade salsiccias. Eovaldi's is also popular for its catering dishes, offering Italian favorites such as homemade speidini and toasted ravioli. Next stop: Mama Toscano’s. From Eovalid’s, turn left on Bischoff and go one block to Macklind Avenue. Mama Toscano’s is at 2201 Macklind Avenue. Mama Toscano's also serves tasty Italian sandwiches, but that's just a side business. Mama Toscano's is first and foremost a kitchen known for its ravioli, pasta, and other Italian favorites. The kitchen makes pasta from scratch and sells them to many local restaurants and grocery stores. Luckily, it also sells directly to the public. Its ready-to-cook toasted ravioli, available in one or five-pound boxes, can't be beat. Mama Toscano's also sells ravioli "ends," scraps of uncooked ravioli that broke apart or extra bits and pieces from the rolling block that can't quite be sold as ravioli. Bags of ends are inexpensive, but great for use in soups and a wide variety of other dishes. Mama Toscano's is a great place to stock your freezer with the same pasta and sauces used by some of the Hill's best restaurants. Next stop: Baseball Hall of Fame Place. From Mama Toscano's go south (right) down Macklind Avenue. The second street on the right is Baseball Hall of Fame Place. Would you believe that one short block of Elizabeth Avenue on the Hill produced three members of the Baseball Hall of Fame? The block, recently renamed Hall of Fame Place, was the boyhood home of Yogi Berra and Joe Garagiola, and the street where broadcast legend Jack Buck bought the first home for his new and growing family. Today, three granite plaques mark the location of each home as well as when their most famous residents were inducted into the Hall of Fame. If you're more of a soccer fan, you can also visit Soccer Hall of Fame Place, located on Daggett Avenue, between Shaw's Coffee and St. Ambrose Catholic Church. Soccer Hall of Fame Place honors five Hill residents that formed the heart of the 1950 U.S. World Cup soccer team that upset top-ranked England 1-0. Next stop: Missouri Baking Company. From Hall of Fame Place, go back north on Macklind Avenue three blocks to Wilson Avenue. Turn right on Wilson and go one block. The Missouri Baking Company is at 2027 Edwards Street. Anyone with a sweet tooth will love the Missouri Baking Company. Of course, there are plenty of Italian cookies, great biscotti, and cannoli. But the bakery, which opened in 1924, also makes some of the best pound cake, stollen, baklava and danishes you've ever had. Grab an assortment of cookies for the road or a pastry or two for tomorrow's breakfast. Next stop: Volpi Foods. From Missouri Baking Company, cross Edwards and go left to the end of the block. Volpi Foods is located at 5256 Daggett Avenue. If you're on the Hill, don't miss a chance to stop in at Volpi Foods. Since its founder Giovanni Volpi opened the doors in 1902, this specialty meat store has produced some of the best and most authentic dry-cured meats in the nation. Today, you may find Volpi salami or prosciutto in national supermarkets, or used within restaurants well outside of St. Louis. But nothing beats walking into the tiny, original retail store and ordering directly from a third-generation member of the family. Samples are offered freely, although they often make it more difficult to decide what to purchase. Try a pack or two of Volpi's original Rotola (which means "small wheel" in Italian). Rotola consists of thin slices of prosciutto or salami wrapped in mozzarella cheese. Some varieties also have herbs or sun-dried tomatoes wrapped into the wheel as well. If you prefer plain ​salami, Volpi has eight varieties. Once again, luckily, samples are offered freely. The Hill has many other shops, markets, and interesting sights. But of course, it’s legendary for the dozens of great Italian restaurants within its borders. Favorites for fine dining include Zia’s, Gian-Tony’s and Lorenzo’s. For a more casual atmosphere, visit Rigazzi’s, famous for its fishbowls of beer, or Amighetti’s, a name nearly synonymous with Italian sandwiches. Amighetti’s is also a great bet for gelato. To return to your car: From Volpi Foods, turn right on Daggett Avenue, go one block to Marconi Avenue. Turn left on Marconi and then right on Shaw, returning to our starting point.